Story-wise, this card’s name is perhaps a little misleading. 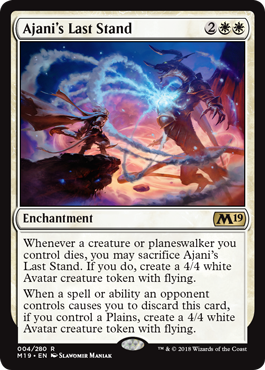 It reflects not Ajani’s defeat, like the cycle of similarly-named cards from Hour of Devastation, but rather a desperate tactic he used to defeat Nicol Bolas during the Conflux event (involving the set of the same name). It is suitably powerful, even against elder dragons: not only does it make the cost for removing almost any creature much too high, it doesn’t require that your opponent kill the creature and thus works with cards like Thallid Omnivore. Including a countermeasure against discard is a good bonus, too. There used to be jokes about keeping a hand with four lands and one Obstinate Baloth back in the days when Thoughtseize and Distress were in the new sets, and you could make them here too.
. . . Although, since it’s on an enchantment, shouldn’t this game text have been in Theros? Ajani’s Last Stand is an interesting card for two reasons. The first is that it can help serve as an insurance policy against a board wipe or a kill spell. Enchantments are usually harder to get rid of, and so it says “kill my creature (or planeswalker), and I get a replacement”. And a 4/4 with flying is a nice replacement, indeed. The downside is that it’s useless in an empty board; you need a creature to die in order for it to trigger. The second reason for Ajani’s Last Stand being interesting is that it’s a hedge against discard effects from an opponent. Like, amusingly, the new Nicol Bolas; getting a replacement able to trade with Nicol Bolas is nice after the dicard effect triggers. And there are other discard sources that work well with this, like Liliana of the Veil in Modern. This is a nifty bit of sideboard tech all the same: there are decks where it will brick, but a 4/4 with flying is something a number of decks will have a use for.